Stranger Things: The Game complete walkthrough, cheats, solutions and where you will find the extra items, like heart pieces, gnomes, eggos, VHS Tapes. Stranger Things: The Game is an adventure game that will take you through the same story from the TV Series. You can explore Hawkins and its surroundings and find locations from the TV Series, like Mirkwood Forest and Hawkins Lab and even some new areas you never seen. Each character in the game has an unique ability that will help you solve all kind of puzzles. Lucas can nail anything with his Wrist Rocket. Nancy has an entire collection of bats to swing this time. If you collect all the Eggos and Gnomes you will find get a surprise after you finish the game. Here's the step by step walkthrough for Chapter 6 "The Hydra" from Stranger Things: The Game. You can watch the video above or follow my text guide below, i will keep it as brief as possible so you won't have to read to much extra stuff. You will find the first keycard in the top right room, take it and use it to unlock the room below. Explore this part until you find a second chest, with another keycard. Use it to unlock the door in this area. In this room you'll find a red button that calls the lift. After exploring this area you will eventually reach another Evil Scientist. To beat him you must first deactivate the lasers, using the 4 buttons, than get near him and punch him. Now you can explore the other rooms in this area. You will find yourself back in the sewers after a while. Use the mice to help you navigate the area. After you get the heart return and look for the elevator that gets you to the Upside Down room. Here search for all the buttons that will unlock the path up, in the main room. When the door opens you can fight the final boss, the Tentacle Hydra. To kill the Tentacle Hydra you have to use the laser beams to make damage to it, and be careful not to die when the reinforcements come. Stranger Things: The Game Chapter 6 "The Hydra" Step by Step Walkthrough, Solution, Cheats, for android, iphone, ipad developed by BonusXP, Inc. Here's the step by step walkthrough for Chapter 5 "Riddles in the Dark" from Stranger Things: The Game. You can watch the video above or follow my text guide below, i will keep it as brief as possible so you won't have to read to much extra stuff. To get a extra reward in Chapter 5 you must look for 5 overdue books and return them. Inside the top right room you'll find a gnome and a gate to the Upside Down. In the Upside Down return to the main hallway and get the keycard from the bathroom. Use the keycard to unlock the door in the top left. Explore this area until you find another chest with a keycard. Now you should find another Gate to the normal world, somewhere in the lower rooms. This gate will take you to where Dustin is. Now you have to get out without being seen. Dustin can trow pudding jars and distract the guards. Use Dustin until you get the 3 keycards and reach the laser room. There switch to Lucas and use him to make those worms go into the laser beams. To get past the laser beams you have to trow pudding jars on the laser beams, he hazmat suit guy will stop to eat there, blocking the laser beams. Now you have to make your way down, to the bathrooms, and find the panels that disables the cameras. Is time to fight the Elite Guard Team. They are immune to your pudding jars, so you'll have to find various ways to kill them using the laser beams. After you kill everyone in this area you'll defeat the Elite Guard Team. To finish this chapter go outside and head towards the underground bunker. Stranger Things: The Game Chapter 5 "Riddles in the Dark" Step by Step Walkthrough, Solution, Cheats, for android, iphone, ipad developed by BonusXP, Inc. Here's the step by step walkthrough for Chapter 4 "Fire and Water" from Stranger Things: The Game. You can watch the video above or follow my text guide below, i will keep it as brief as possible so you won't have to read to much extra stuff. Crack the wall in the middle to move up, then, in the next room, take a ride on the water at the right side. Explore the sewers in this area until you find the green keycard. You'll notice you can control the water stream with the wheels (you can also use the slingshot to spin them). Return to the first room and use the keycard to open the door on the left. Explore this area until you find another keycard and a room with a fence and a wheel that stops the main water flow. Now go around and search for another green keycard and another wheel that stops the water stream where Will is. Go talk to Will to unlock him as a character. Use him to get the tube of pink lipstick. Now find the room with 4 vertical water streams, below it you'll find a gate to the Upside Down. Here start by killing the tentacles on the right and go explore that side and you'll find another keycard. Go back to the normal world and use the card to open the gate in that room, than punch that panel. Now go in the left room and use the 2 wheels to stop two water streams. Now you should be able to go to the Hazmat Gunner boss. The strategy to beat him is to wait until he starts to shot his gun. Then go around him and punch him from behind. Stranger Things: The Game Chapter 4 "Fire and Water" Step by Step Walkthrough, Solution, Cheats, for android, iphone, ipad developed by BonusXP, Inc. Here's the step by step walkthrough for Chapter 3 "The Voice in the Radio" from Stranger Things: The Game. You can watch the video above or follow my text guide below, i will keep it as brief as possible so you won't have to read to much extra stuff. You need a keycard to open the first door, you'll find one in the left area of the school. Open that locked door and push the rolling cart on the button in the corner, this will open, a bit, the door in the middle room. You will have to repeat everything you did on the right side. After you puss both buttons the middle door will open all the way. Now explore the left area until you find a keycard, then go back and explore the right area you'll find somewhere another keycard, and after you solve the puzzle in the library you will find a portal that leads you into the Upside Down. Now go back through the left rooms, until you'll find another green keycard, than you can go in the top rooms where you'll find another Gate that takes you to the normal world. Here you'll unlock another character, Mike. Mike has a stunt gun, that you will use to stunt enemies, on buttons that will help you go through doors. Use Mike's stunt gun to navigate through the left part of the school, until you'll exit outside. Outside you'll find the boss "Conspicuous Van". The objective is to crash the van, so make it hit the obstacles on the road, like trash cans and mail boxes. Stranger Things: The Game Chapter 3 "The Voice in the Radio" Step by Step Walkthrough, Solution, Cheats, for android, iphone, ipad developed by BonusXP, Inc. Here's the step by step walkthrough for Chapter 2 "The Gate" from Stranger Things: The Game. You can watch the video above or follow my text guide below, i will keep it as brief as possible so you won't have to read to much extra stuff. You'll need to go up, but first you need to kill the tentacle monsters. To do that you have to punch the egg shaped things and push them near the tentacles, they will explode after 3 punches and kill anything that's near them. Do the same in the next room and go through the portal. Kill the two bats and go inside the tree. In the next room you'll have to get some help from the bear. Use the slingshot to knock down the bee hives, the bear will come and it the honey, and he will also break through the log and clear the path for you. Now go to the up area, and punch the bear trap to disable it. In the area blow you'll find a green keycard that you'll use to unlock the door in the area above. Now punch your way through the left rooms until you find another keycard. Now go back the the room where the bear is, and guide him, using the bee hives, until he clears the path above (make sure to deactivate the bear trap for him). Punch the button and it will open the first door. Now keep going up and punch your way until you open the second door and eventually find Nancy. Nancy has a baseball bat that can break tough things like the logs. You will open the third door right in the room where you found Nancy. Now explore the remaining areas, using Nancy, until you'll find the last button that opens the forth door. To finish Chapter 2 you have to get back into main town, and go to Hawkins Middle School. Stranger Things: The Game Chapter 2 "The Gate" Step by Step Walkthrough, Solution, Cheats, for android, iphone, ipad developed by BonusXP, Inc. Here's the step by step walkthrough for Chapter 1 "The Lost Boys" from Stranger Things: The Game. You can watch the video above or follow my text guide below, i will keep it as brief as possible so you won't have to read to much extra stuff. You'll disable the pink laser by going into the room on the right and pressing the pink button. Then keep going through the rooms on the right, in the last one you'll find a green keycard. Now go to the main laser room, and use the green keycard to open the left door. Here you'll have to go in the up rooms and you'll find another keycard inside a chest. This keycard will open the door on the left. There you'll find the first boss, just turn on the lasers, at the right moment, to kill him. In the last room you'll find Lucas, which you can now use as a character. Go back to the first room, as Lucas, (use the slingshot to deactivate the laser). Than go back up, and you will be able to open the door on the left using the slingshot. There you can deactivate the red laser in the main room. Now you can also open the door on the right with the slingshot. Kill the guys in that room than move to the next one, where you'll find another boss, just do the same laser trick to kill him. Keep going through the rooms, after beating some guys and bosses you will reach the room where you can deactivate the blue laser. Now go back up, and into a room on the right side you will find the button that deactivates the yellow laser. Now that all the lasers are disabled just go back to the main room and the door will open. Here you'll find a top level boss, Evil Scientist. First hit him a few times with the slingshot. After he turns on his "force field" you will have to beat him up with your fists. Deactivate the laser, switch to Hopper and give the Evil Scientist a few punches. Switch the laser off again and with another 3-4 punches you'll win this fight. Now get out of the building and go to the forest where you'll find Steve (use the map). He will tell you to go find Nancy in the woods. You'll find the entrance to the Upside Down, but it's a toxic place and you need a suit before you can go there. You'll find the suit at the morgue (check the map). Chapter 1 ends when you go through the Gate in the Upside Down. 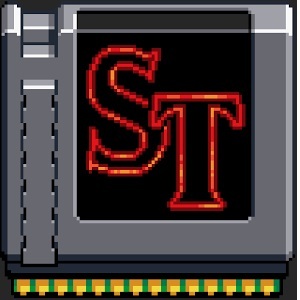 Stranger Things: The Game Chapter 1 "The Lost Boys" Step by Step Walkthrough, Solution, Cheats, for android, iphone, ipad developed by BonusXP, Inc.